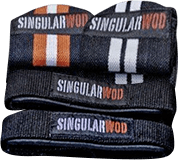 Fabric wrist wraps for strength training. Protect your joints when you work out with heavy weights and prevent pain. Our fabric wrist wraps are part of the personal equipment that every athlete should have. Its fabric will not tear under pressure exerted on the wrist when carrying out strongman, powerlifting or weightlifting exercises. They are extremely simple to adjust. Simply wrap the wristband, followed by the end cord, around your wrist and then tuck it under. You can feel the pressure and the fastening of the wristband by holding your wrist with your hand and turning your arm. They are indicated for workouts where the exercises constantly change given that you can tighten them or loosen them as required. They are available in pink, green and red. There are other options such asour elastic wrist wraps or our weightlifting wrist wraps. Colour: Black and red / black and green / black and pink. Elastic wristband with Velcro fastener for workouts, weightlifting, strongman or powerlifting. Protect your joints during training.